Delight your senses: Do have the Perfect Proposal story??? 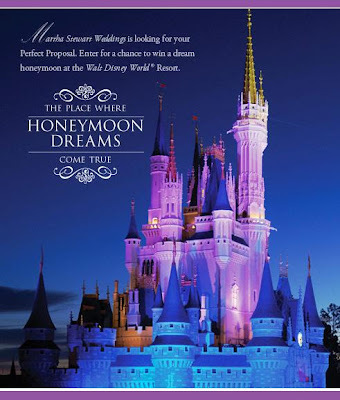 Do you want to spend a week a the Walt Disney World Resort here in Florida?? Well Martha Stewart wants to here all about your proposal and she wants to give you a weeks stay at WDW!! You get to stay in the Cinderella suite! Go HERE and upload a photo of you and your loved one and tell them the magical tale of your perfect proposal!